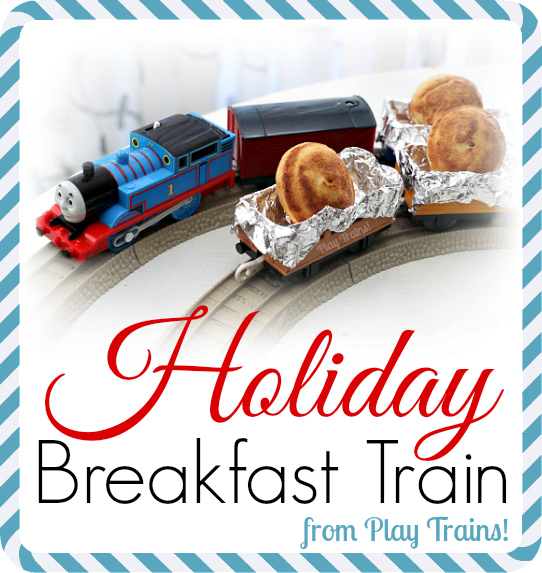 For our second activity for the Christmas Play Days series, we’ve put a train twist on a family tradition by putting our beloved holiday breakfast on a toy train. 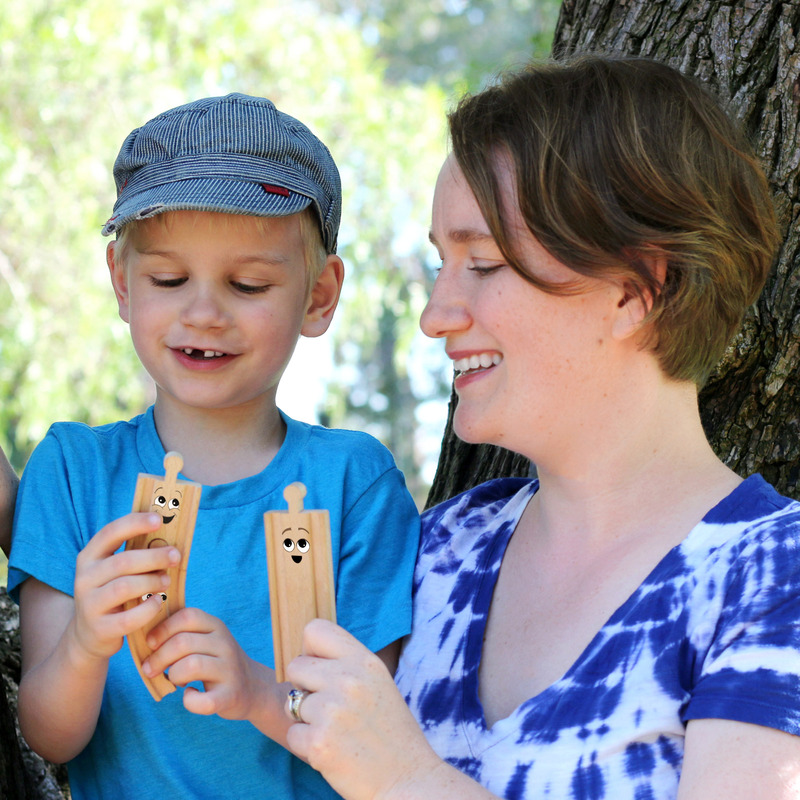 This is a fun Christmas morning activity that works just as well for birthdays (the photos of the activity are from the Little Engineer’s fourth birthday), other holidays, or any morning when playing with food sounds exciting. It doesn’t take long to set up, and from the Little Engineer’s delighted reaction to the experience, it’s bound to make things merry and bright around the breakfast table. You could put any smallish breakfast food in the freight cars. 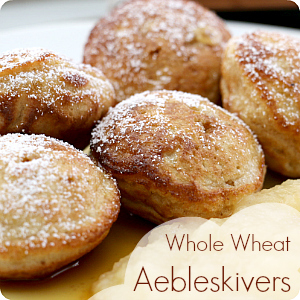 But if you love pancakes and waffles, don’t miss our Whole Wheat Aebleskiver recipe. And make sure to check out today’s activities from my fantastic friends, Shaunna from Fantastic Fun and Learning, Rachael from Nothing if Not Intentional, Chelsey from Buggy and Buddy, Mary Catherine from Fun-a-Day!, and Ann from My Nearest and Dearest! Do you have a favorite holiday food tradition? While I didn’t grow up eating and making aebleskivers, it’s a holiday tradition I’m glad to have married into. Before I became a mom, I looked forward to eating them two or three times a year. Once the Little Engineer came along, I couldn’t wait to introduce him to the tradition! I love the memories we make every Christmas morning, when he makes aebleskivers with the whole family. 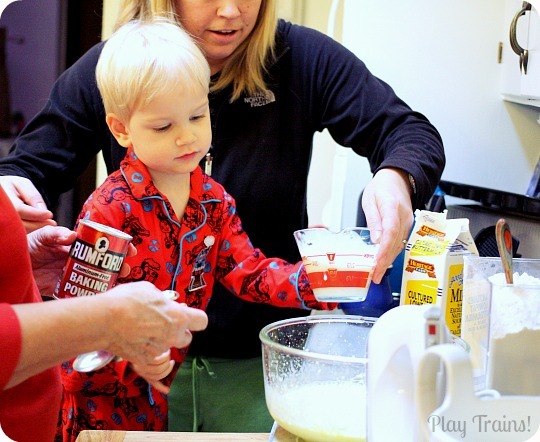 Here he is in his Christmas pajamas last year, cooking aebleskivers with his aunt and grandma. It’s hard to imagine that we were able to make aebleskivers even more special this year. But we did. And of course it involved trains. I’ve always been struck by the odd similarities between aebleskivers and takoyaki. They’re cooked much the same way, despite the fact that one tastes like a cross between a pancake and a donut and is often filled with apple slices, and other is savory and filled with octopus! 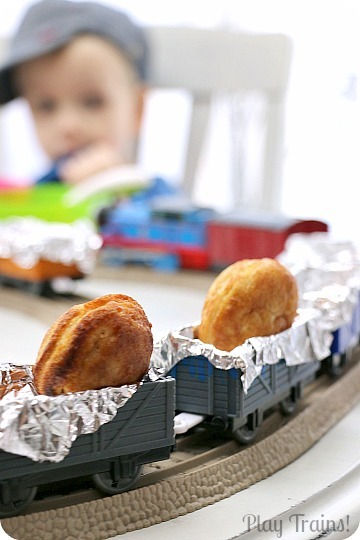 I’ve wanted to do an aebleskiver train with the Little Engineer ever since we first saw their video, and I’m so glad we finally did. All right, here’s how to put it together for yourself. 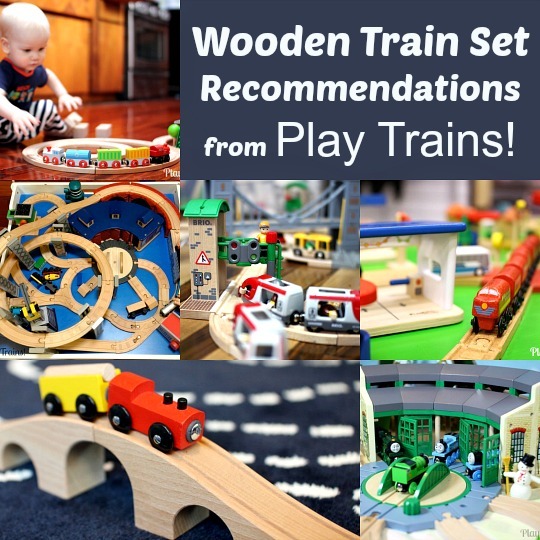 Trains and tracks — We used Trackmaster trains, tracks, and Troublesome Trucks (much, much better price on the Troublesome trucks and other Trackmaster freight cars at Toys’R’Us right now), but wooden or model trains would also work, as long as the food you choose fits in their freight cars. 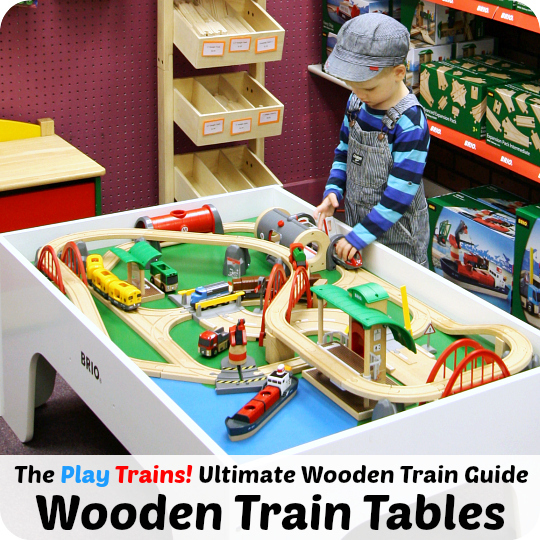 If you’d like to do this with wooden trains running around the tracks, I can recommend the Brio RC Train Engine, battery-operated Thomas and Friends engines, or the Imaginarium Power Steam Engine Set (best to buy Imaginarium trains at Toys’R’Us). 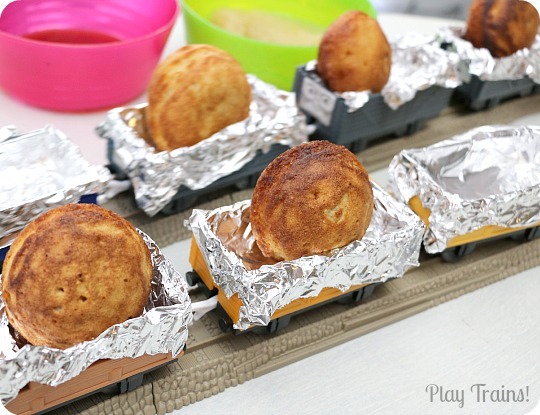 Take’n’Play freight cars are perhaps a little too small — and a little too hard to come by — to work, but if you have some, you could serve small foods (cereal, little crackers, berries) for fun. Aluminium foil — I cleaned the freight cars before we put them on the table. Even so, I didn’t want to have the Little Engineer eating directly out of them, so I lined the cars with foil. 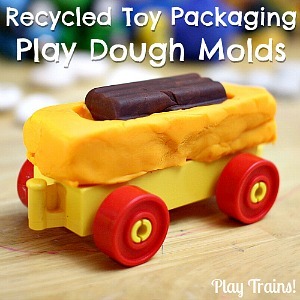 Yummy food — You can use any festive food you want, or just fill the freight cars with your child’s favorite foods (or ones you’d like to have become favorites). We used my healthier whole wheat version of my husband’s family’s recipe for aebleskivers (you may know them as Danish round pancakes). Damp towel or napkin — If you are serving sticky foods, like the maple syrup and applesauce that goes with our aebleskivers, a damp towel or napkin can help keep the stickiness off the trains. 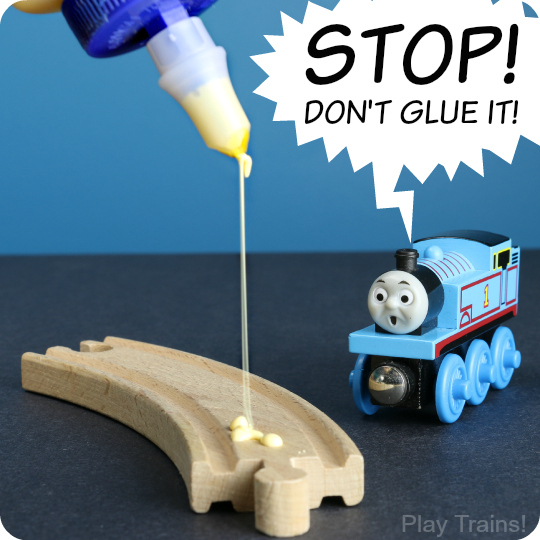 It turned out that we didn’t really need it, because the Little Engineer was being extremely careful not to drip syrup anywhere near his trains, but usually he gets pretty sticky so it pays to be prepared. 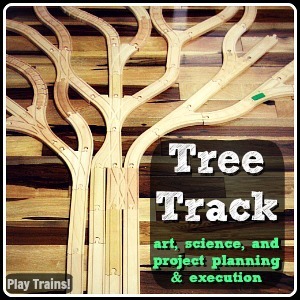 Build tracks on the table on which you plan to serve the food. 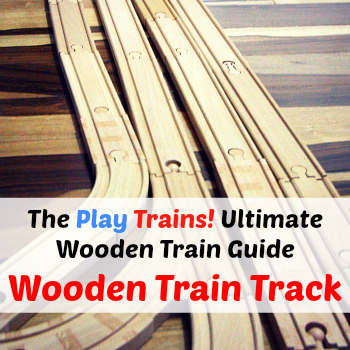 Place engine and freight cars on the track and couple them up. Line the freight cars with foil and add the food. Set the train running on the track, and have fun! 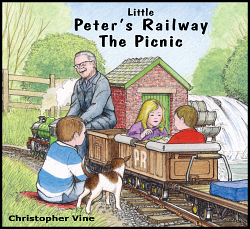 I’ve written a review and activities for the wonderful hardcover Peter’s Railway series of books for children in the past, but I haven’t yet had a chance to write about the smaller, paperback titles Christopher Vine has written to accompany them. Some of the paperback books are written for children younger than the primary audience for the hardcover books (which are great for school-age kids, or preschoolers who are ready to listen to chapter books). In Little Peter’s Railway: The Picnic, Grandpa Gerald takes Peter and his twin siblings, Kitty and Harry, on their miniature steam engine for a picnic. The next day, Peter’s mom spies on her children eating and drinking from Peter’s model train cars! 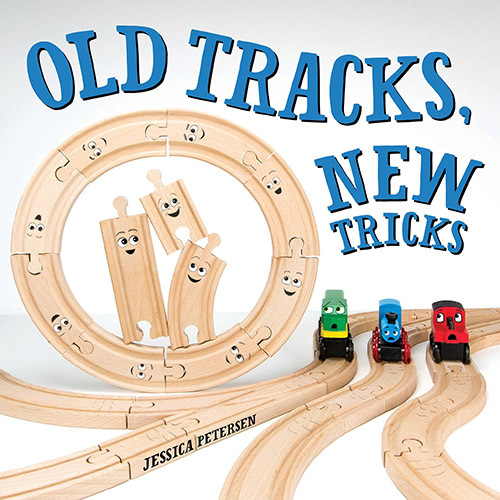 It’s a super cute book, and the Little Engineer always wants to eat food from his trains after reading it, so I was happy I managed to track it down on the day we did this activity. And don’t miss our other Christmas Play Days Activities! What a fun way to make Christmas morning that much more exciting! I love the book and recipe suggestions, too. 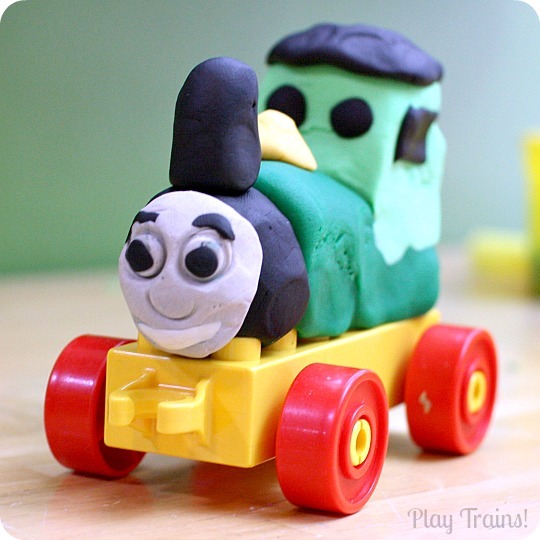 Love the combo of well crafted words, kids, trains and cooking. What a nice blend of your talents ! What a lovely idea. 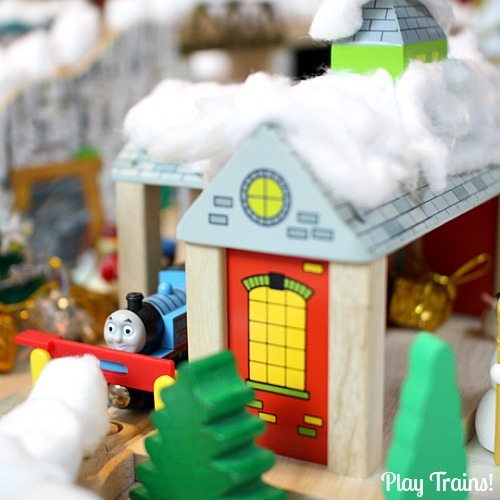 We have a buffet for Christmas and we have a huge train table which we could use to do this – thank you for sharing.